“I was very shocked. 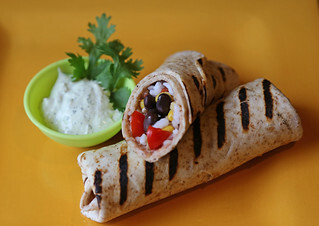 Really, really shocked,” said Tiffany Aaron of Cleburne County, who took first place with her Grilled Rice and Black Bean Burritos with Creamy Cilantro Dipping Sauce. Aaron’s winning dish earned her a featured spot in the 2015 Arkansas Rice Expo Cookbook, $200 and a gift basket with rice. The three judges –South on Main restaurant’s Executive Chef Matt Bell, Food Writer for Sync and Arkansas Life Magazine Emily Van Zandt, and Little Rock Soiree and Arkansasbusiness.com Writer Lee Hogan – all agreed that Aaron’s dish deserved to win. “On the winner, it seemed like we had the same opinion,” Hogan said. While this wasn’t her first time competing in a cooking contest, it was her first time winning first place. Aaron said she had previously met some of the contestants and knew that they could cook really well. “They know what the judges were judging,” she said. Developing a rice burrito dish was a no-brainer. As the 2014 winner, she cannot compete in the 2015 contest. However, Aaron said she encourages her mother and kids to compete next year. The second place winner for the contest was Susan Bensberg from Ouachita County, who made Ginger Curry Lime Chicken Salad with Edamame and Rice. 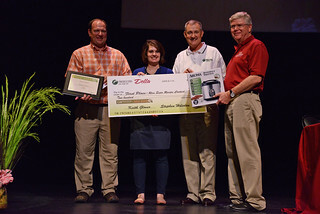 “I never expected to win the top 10 when I submitted my recipe, and I won the second place,” said Bensberg, who is an adjunct faculty in the music department at Southern Arkansas University. The summer weather and her love for Arkansas inspired her to make a cool salad that has lime, ginger, water chestnut, as well as Arkansas grown long grain brown rice and edamame. “I cook things from scratch,” she said. She discovered the ‘pasta method’ to cook rice by putting a cup of rice in 12 cups of water that has been brought to boil. Simmer the rice until tender – about 15 minutes for white rice and 20-25 minutes for brown rice. She drained it and put the rice back in the pot to let it steam. The rice won’t stick together and it’ll have a good flavor, she said. Judge and chef Matt Bell agreed that the ‘pasta method’ with a lot of water and a little rice is the best way to cook rice. Bensberg is planning to compete in next year’s Rice Recipe Contest as well as joining the tabletop centerpiece contest. Third place went to Alice May Johnson of Arkansas County with her Rice and Broccoli Salad. Johnson said she wants to compete again next year. “I’m thrilled to death because I can come back next year,” she said, of her much-complimented dish. “Every time we have potluck (at work), I always make the broccoli salad,” she said. For the contest, she added rice to the salad. Johnson shared her secret for what she called the ‘perfect rice’: boil 14 cups of water, a table spoon of salt, and four cups of white rice cooked for 15 minutes in an un-lidded Dutch Oven on the low heat stovetop. After it’s done, remove from heat, pour into a big pan with holes in it and run hot water over to the rim to rinse the rice. “What’s unique is it’s with no lid,” she said. The bottom line is that rice can be an important part of an overall healthy diet. Rice is in the grains’ group, one of the 5 main food groups on MyPlate, a nutrition guide by the U.S. Department of Agriculture. Rice provides protein and carbohydrates for energy and a number of vitamins and minerals. rice is a whole grain and has “more fiber, vitamins, minerals, and antioxidants than white rice,” she said. She recommends making half of your grain foods whole grains. To learn more about rice production, visit www.uaex.edu or contact your county extension office.